The ceremony to announce the selection of Bengaluru’s first ever Bicycle Mayor was held at The Park in Bengaluru, on Monday, May 21, 2018. 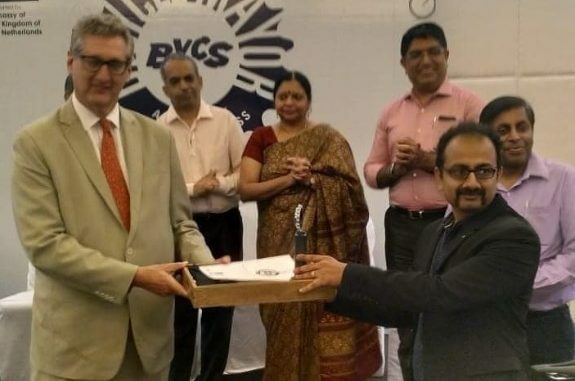 Mr. Jaap Werner, Consul General of Embassy of the Kingdom of the Netherlands declared Sathya Sankaran as Bengaluru’s newly chosen Bicycle Mayor. Sathya came to the stage along with his bicycle, to receive the recognition. Everyone working in the field of sustainable mobility is familiar with Sathya Sankaran. He draws inspiration from every citizen who is dedicated to the cause of cycling and pedestrianisation, and those who depend on cycling to earn their daily living. “They are the real heroes and I drive energy from them,” said Sathya, who was chosen as from a shortlist of six applicants. He is the third bicycle mayor in India after Nikita Lalwani of Vadodara and Arshel Akhter of Guwahati. 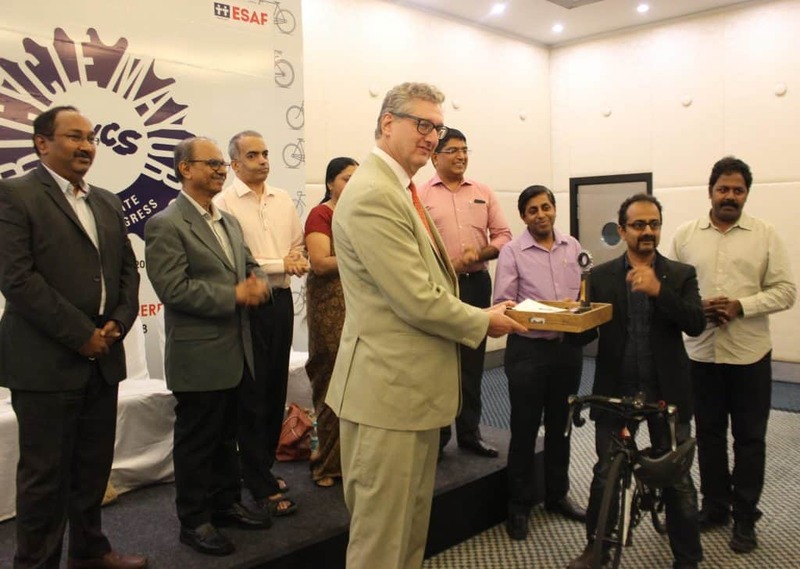 Jaap Werner, Consul General of Embassy of the Kingdom of the Netherlands conferring the title of Bicycle Mayor to Sathya Sankaran. Guests included Manjula. V, Former DULT Commissioner and Additional Chief Secretary to Health and Family Welfare (Medical Education), Murali Krishna, Special Officer, DULT, Mr Bhaskar Rao, Additional Director General of Police, KSRP and jury members Dr Ashwin Mahesh, Prof. Ashish Verma and Srinivas Alavilli. Satya takes on the position, which is a voluntary, two-year role, that will see him serve as a liaison between civic authorities, activists and communities to encourage cycling in the city while lobbying to improve the cycling infrastructure that will enable people to safely ride bicycles in Bengaluru. The bicycle mayor program was instituted by Dutch NGO ByCS with the aim of getting 50% of the population to use non-motorised transport as the primary form of commute by the year 2030. His 40-km commute to work every day spurred Sankaran to reflect on the mobility crises faced by Indian cities and the resultant challenges such as pollution and congestion. As the Bicycle Mayor, he hopes to work at the intersection of the authorities, the people and the market to change mindsets and increase the modal share of cycling in cities. He practices tactical urbanism through his work with two NGOs he co-founded – Citizens for Sustainability and Praja RAAG. Satya was part of a Non-Motorised Transport (NMT) task force created by the Directorate of Urban Land Transport (DULT) and played a role in the roll out of the Cycle Day program, with an aim to build a cycle lobby and create awareness about cycling. The Cycle Day program has become the longest running open streets event in India. Sathya Sankaran is aware of the need to bring various stakeholders to the table to increase the number of cyclists in the city. On his first task as Bicycle Mayor, he hopes to bring together the other nominees who had applied for the role and those working in the field, to actively improve the cycling culture in the city to form a Council for Change. The election of a bicycle mayor in Bengaluru has come on the heels of an announcement of plans by the BBMP to launch a public bike-sharing network in the city with a fleet of 6000 bicycles. Sankaran outlines three main challenges in getting more cyclists on the roads of Bengaluru – behaviour, policy and economics. He hopes to educate people about the ill-effects of the congestion-pollution complex to dismantle the notion that cycling is not an attractive or aspirational mode of transportation. In the policy sphere, Sankaran has set his sights on evolving a comprehensive Non-Motorised Transport Policy and campaign for a Unified Metropolitan Transport Authority (UMTA). He also hopes to lobby for a dedicated budget for cycling and pedestrianisation with the Bruhat Bengaluru Mahanagara Palike (BBMP). Sankaran hopes to kickstart his tenure, by reaching out to school children from classes 1 to 10 through efforts such as teaching Physics, Maths, Biology, Civics, Health and Environment through bicycles. He aims to pilot a shared streets concept in places in Bengaluru where it is not possible to have dedicated cycling tracks. Sankaran will meet with the Mayor of Hague on 25th May 2018 when the Dutch delegates visit Bengaluru. Full disclosure: Sathya Sankaran is an activist for sustainable transport in Bengaluru. As part of his activism, he has authored articles for Citizen Matters and has helped organise citizen meetings in Sanjayanagar. 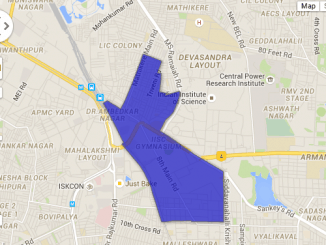 How was the 2010-15 BBMP tenure for Malleshwaram ward? 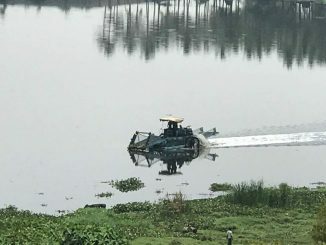 What were the works done? What are the issues troubling the citizens here? After the half-baked Intelligent Transport System that is not really helping any commuter, BMTC is now onto Smart Cards—that have been launched even before the pilot. I am delighted to note that we have a bicycle mayor in you. Congratulations! Hard and sincere work always pays. I was a bicycle enthusiast during school and college days – I did a 100 mile trip in summer of 1969, in West Bengal and Bihar. I live in Brigade Meadows, a community of 1800+ flats. A large number of people travel to and from the Art Of Living Ashram which is about a mile away. Many are from outside who come for a week or two for some programme. How to explore cycling here?